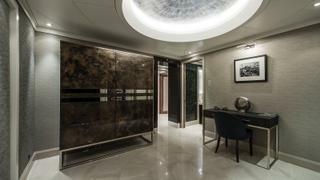 With the ability to construct entire interior schemes and bespoke pieces to scale at its larger-than 10,000 square metre combined production facilities in Greece and Germany, it is unsurprising that MVS has become one of the key players in the superyacht and luxury residential interiors market. Champions of a “turn key” philosophy, its diverse team of project managers, carpenters and engineers are able to visualise the finished product and iron out any kinks prior to final on-site assembly. 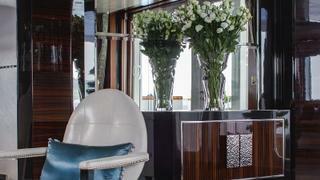 It is this reputation for precision, expertise and attention to detail that has made it so popular with superyacht owners, who commission entire interior arrangements as well as individual pieces of furniture with the confidence that MVS will bring their vision to life. Established in 2006, MVS has worked with some of the very best designers from around the world to create bespoke pieces for private clients. One major milestone for the company was its 2010 collaboration with renowned designer Felix Buytendijk, with whom it worked on the 60 metre Nobiskrug superyacht, Jamaica Bay. The well-respected Dutchman turned to MVS to support him in bringing to life his ambitious vision of a luxurious yet classic yacht, which would comfortably accommodate up to 12 guests, and simultaneously boast leisure facilities such as a swimming deck and gym. 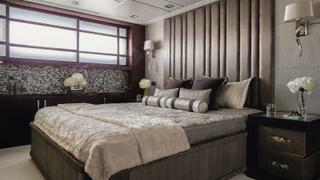 Custom-made furniture by MVS included built-in wardrobes, beds, nightstands, desks and vanity units, as well as sun loungers, all rendered in chic mahogany wood with a high-gloss finish. Another important project involved working with designer Jonny Horsfield of H2 Yacht Design on the furniture for the 55.4 metre superyacht Turquoise. Delivering the project in a record time of four and a half months, MVS was integral in the actualisation of the elegantly sumptuous interior, producing the likes of high gloss ebony macassar pieces with metal inlays, custom-made hardware, and skilfully applying mother of pearl details and natural shagreen leather finishes to furniture. MVS is currently working on a project with award-winning studio Terence Disdale Design, which has required the mastering of the highly labour-intensive technique involved in creating a marquetry motif. Involving precision-cutting wood, and carefully selecting veneers to match the desired grain and finish, MVS has also employed a pioneering new soft staining technique to obtain the right colour for each piece, which was developed specifically in-house to ensure a flawless end result. “Working with Daniela Zulli from TDD pushes us to the limits of our imagination,” says Stef Manos, one of the co-founders of MVS. 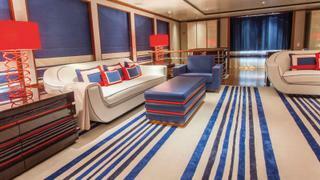 “As well as negotiating different construction and colour techniques in order to produce the masterpiece we intended, we did so under the increasingly stringent yacht code regulations, which of course brings an extra layer of complexity,” he adds. The company is currently working on marine and land projects with other designers, including Nuvolari Lenard, Francesco Paszkowski and Tino Zervudachi. Attracting such a high calibre of designers proves just how highly regarded MVS is in the industry, and is testament to the quality of its work. MVS has already set in motion an ambitious plan to expand its output and build further on its gained experience, while staying true to its mission to transform every client’s dream into a reality.